So, before we get into what we need to do to improve our fitness, let’s talk about what it actually is. Forget for a moment that all the glossy magazine images and Instagram posts don’t exist and let’s simply define fitness as what it is and how it applies to the human body. Fitness is the ability to complete a task. And so, just like that, you have to think of your fitness as task-specific. What are the tasks that you want to be able to accomplish? Do you want to restore your ability to live a functional life? Do you want to play a sport? Do you want to train for a race or a strength competition? Regardless of the task, there are three qualities that your body needs to have in order to function well in a way that is resistant to injury and does not restrict your participation in daily activities. These are strength, endurance, and cardiovascular fitness and are the foundation of basic fitness. These qualities need to be in place in order to optimally build a more functional and athletic body. To have a better understanding of these qualities, we’re going to take a look at exactly what they are, what physical adaptations contribute to their development, and what training methods are used to acquire and improve these qualities. Strength: Are you Strong Enough? If you ever have a chance to speak to my clients and athletes they will tell you that my approach to fitness is a simple one: strength first. They will also tell you how I’ve helped them to compete in weightlifting and powerlifting at the national and world level, prepare for CrossFit competitions and Spartan races, improved their athletic performance on the field in a variety of sports, and got them strong and conditioned enough to complete long distance endurance events such as marathons and 100 mile bike rides. I’ve also helped people overcome chronic back and joint pain, regain basic mobility, and lead a more active life. I don’t achieve this through some crazy complex training system. I simply focus on fixing the number one problem in most people’s fitness: they just aren’t strong enough. Strength is one of the most powerful tools in the box. It has tremendous benefits to both health and performance, but most people don’t take the time to develop it properly. The truth is, most people from ages 7-8 on up to 80 and beyond can benefit a great deal from strength training. Strength is the foundation of endurance, power, speed, flexibility, and balance. Without a good strength base, none of those other things can be optimized. Strength training not only builds muscle, it strengthens connective tissue, coordinates the nervous system, and can improve flexibility and range of motion. Don’t make the mistake of thinking that strength is merely a function of the muscular system. In fact, the nervous system is primarily responsible for what we think of as strength, ie, the ability to exert force. The inevitable consequences of aging: getting weaker, losing muscle mass (sarcopenia), and losing bone density, can have catastrophic results on your health and quality of life. It has been shown that a lack of strength and muscle mass has a direct correlation to early mortality. Strength training improves bone density in post-menopausal women and can mitigate chronic back and joint pain simply by providing muscular and connective tissue support to the spine and joints. It turns back the clock, revs up our metabolism, prevents injury, reverses some medical conditions such as Type II diabetes and cardiovascular disease, and gives us the freedom of mobility and independence long into our twilight years. Strength is essential to good quality of life and the foundation of good movement. To move correctly, the body needs a foundation of strength that allows for postural and joint stability under load that allows for consistency of correct movement. In individuals we typically describe as athletic, movement is efficient, consistent, and looks “easy”. Whether it is a running stride, a jump, a throw, or a complicated gymnastic movement, the execution is repeatable, time and time again. In the non-athletic individual, you will see a lot less efficiency, a lack of balance, movement patterns are inconsistent, and he or she will probably look “floppy” or uncoordinated. “Floppy” may sound humorous, but is a key term here because it indicates a lack of postural strength. Postural strength for all intents and purposes, is the ability to maintain one’s posture over time or through a series of complex powerful movements. You can think of postural strength as core strength, but its much more than that. It is the ability to actively support the spine and associated joints (shoulders and hips). When we can no longer actively support our joints due to weakness or fatigue, we begin to slouch and our posture changes over time. We also lose our balance more easily and become less coordinated. Think about how you feel after a long day at work. If you have a hard time maintaining your posture when you’re tired, you lack postural strength. Without the support of the muscular system, the skeletal system will actually begin to remodel itself into these unideal postures. Think about the posture of your average desk worker: head and shoulders tilted forward, rounded upper back, rounded or swayed lower back. These postural deviations may seem permanent, but can be improved simply by getting stronger. Furthermore, by getting stronger, one can maintain more ideal posture for longer periods of time and these deviations become less likely to occur. For full body strength, the major joints must be strong through a full range of motion and in concert with the muscles that support the spine. Full body compound movements, squat, press, deadlift, etc., that build strength in the shoulders, hips and knees improve the ability to react and respond to external forces as well as improve coordination, stability, power, strength, and speed. Whether we are talking about tackling a running back or being able to recover one’s balance from accidentally stepping off a curb, this ability to respond to external forces is incredibly important. This is why basic strength training works so well for sport and life. What exactly does strength training look like? Well, you can work with barbells, dumbbells, machines, kettlebells, your own bodyweight, or odd objects. A mixture of compound movements and single joint movements will create a well-balanced program. We are generally looking to complete between 20-50 total reps with good form, not going to failure. This could mean 3 sets of 8 reps, 5 sets of 10 reps, 5 sets of 5 reps, it doesn’t really matter. 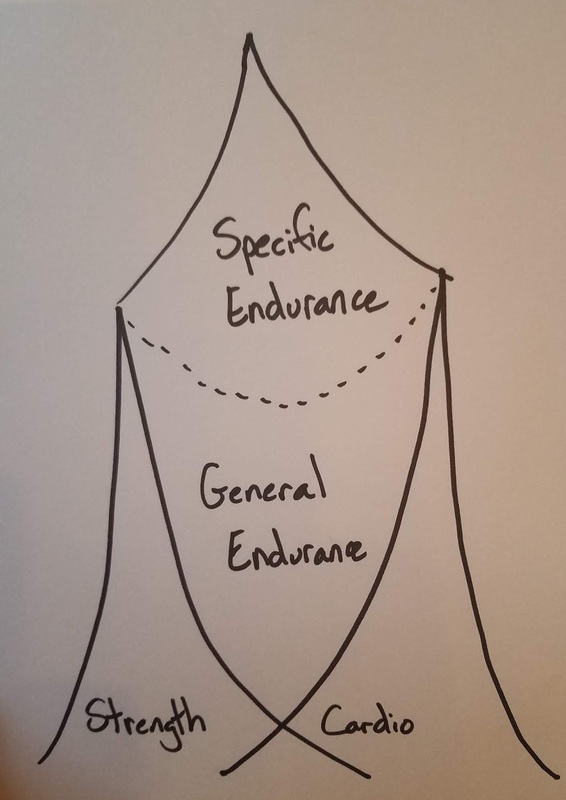 Higher total reps will contribute more to the endurance end of the spectrum whereas lower total reps will contribute more to the upper limits of the strength spectrum. Its good to train in both ranges and a lot of strength athletes will vary between the two, ie, high reps with lighter weights for one cycle and then lower reps with heavier weights for the next cycle. When doing this, you are basically honing two skills, one is to do more work, the other is to maintain good form under heavier loads. Both contribute to overall strength gains over time. Oftentimes, those who are afraid of looking “big” from strength training just need to lose some extra bodyfat so you can see the toned muscles under the skin. Fat loss is mostly driven by diet and additional cardio which we will discuss later. Unless you are on anabolic steroids, you are at very little risk of getting “too big” in the weight room. A lot of those big buff bodies you see in magazines and on social media have had some pharmaceutical help in addition to hours in the gym. And what ends up being the benefit of focusing specifically on strength? For my clients, anyway, they experience an increase in quality of life, freedom from pain, an increased ability to do activities they enjoy, and the ability to do work around the house and yard that was once out of their reach. Getting “big” is a non-issue because not only does it not happen, they often like the way their muscles look when they get a bit more tone and definition. The simple conclusion we are reaching for is that strength training is something we should all be doing. Basic, full body, compound strength training with significant loads contributes to quality of life, longevity, improved health, and freedom from pain. Whatever movements you use, they must be appropriately loaded and performed with consistent, good form. It really is that simple. For most people, no matter what their daily activities consist of, if you can get stronger, you will live better. Cardiovascular Fitness: How fit is your heart? Cardiovascular fitness is the ability of your heart and lungs to deliver oxygen and nutrients and eliminate waste to and from the parts of your body including your muscles and organs. It is vital for good health to include cardiovascular training in your weekly routine. The adaptations from this kind of training include increased number of capillaries in the muscle, increased blood volume, lowered blood pressure, and increased lung capacity . At the cellular and metabolic level we also see an increased capacity to utilize oxygen and get rid of carbon dioxide, buffer lactic acid, and use nutrients more efficiently through an increased number of aerobic enzymes and mitochondria. In other words, cardiovascular fitness training makes your body able to nourish and clean itself from the inside out, as efficiently as possible. When your circulatory system is working optimally, everything runs better, you feel better, you think more clearly, and you have more energy. You can more effectively deliver oxygen and nutrients to working muscles and organs and work becomes easier. Cardiovascular fitness can include many activities including walking, swimming, biking, running, dancing, rowing, etc. It simply requires that you get your heart rate up and keep it up for a sustained period of time. It can be done for lower intensities for long duration or high intensities for short duration. But the most effective way to get the most bang for your buck is to just get out and do whatever activity you enjoy at an intensity that you can sustain for at least 20-45 minutes, 3-5 days per week. Don’t think of this as exercise, think of it as medicine. Endurance Training: Where strength and aerobic conditioning meet. Endurance typically means activities that we think of as “cardio”. When we think of cardio, we tend to think of all the machines at the gym such as the elliptical, the treadmill, the bike, and the rowing machine. However, endurance as a concept covers more than that and is a very specific quality. Endurance is the ability of the muscles, heart, and lungs to sustain work over time in a manner that is repeatable and consistent. Endurance describes any repetitive activity done over time. It could be loading boxes on a truck for four hours, walking 100 miles, being able to sustain a two hour wrestling practice, or simply the ability to maintain one’s posture against gravity over the course of a day. You could say that the “endurance” we all require relates back to the concept of fitness being the ability to complete a task. Do you have the endurance to get through your day? If not, we need to improve your general endurance with strength training and aerobic conditioning. If you participate in a specific endurance sport, your specific endurance activities need to be part of your training as well, but an appropriate dose of strength and aerobic conditioning will optimize your performance. A powerlifter who does no cardio would find that by adding in some regular aerobic work will boost her endurance in the weight room, ie, she can train longer and recover faster because she is cardiovascularly and metabolically more fit. A runner who does no strength work will find that by adding some strength training, he can maintain his posture longer and may improve overall speed and power because he is stronger and can therefore better maintain his posture and exert more force. Instead of thinking of endurance as a way to train, think of endurance as the ability you develop through training to carry out daily tasks and activities as optimally as possible. Training adaptations from endurance training alone include several of the adaptations that occur from strength training, ie, muscle and connective tissue strength and increased coordination, but there are also adaptations of the aerobic system, ie, the heart, lungs, and blood vessels that transport oxygen, carbon dioxide, nutrients, and waste throughout the body. However, endurance training alone is not optimal for building limit strength and endurance training that is not long in duration is not optimal for building an aerobic base. If you are having a hard time with endurance or stamina in your daily routine, sports practices, or workouts, it may require that you get stronger, increase your aerobic conditioning, or both. Think about where you are having a hard time. Are you losing your ability to maintain your posture and move well (strength)? Or are you just getting tired (aerobic conditioning)? Rarely would you need to do muscular endurance workouts in the gym outside of increasing the volume and decreasing the weight on your strength workouts. There is always room for some higher intensity aerobic conditioning work to boost stamina, but these are most effective when performed infrequently and/or for very short duration sessions. However, consider where you are in your fitness journey and whether or not you can simply turn up the intensity on your strength sessions or increase the duration/frequency of your cardiovascular sessions. In the following figure, you can see that your level of endurance for general activities is dependent on your overall strength and cardio base. In order to improve a specific endurance ability such as running or rowing, you have to specifically train that skill, but your overall capacity will still be dependent on your strength and aerobic base. The current fitness trends include a lot of high intensity interval and circuit training with light weights in the gym. While this kind of training can enhance your fitness base in the correct dose, a steady diet of these workouts is less effective than individually training strength and aerobic conditioning. If you waste your time and energy doing muscular endurance workouts in the gym, you have that much less in the tank to build overall strength and aerobic conditioning which will serve you far better in the long run. The body can only recover from so much. And remember, unless your goal is for your life to revolve around the gym and recovering from the gym, there is simply no need to constantly grind yourself into paste. As an aside, this is where a lot of mistakes are made in utilizing high intensity interval or circuit training as a primary general fitness tool. HIIT for the most part, in most fitness programs is simply short-duration muscular endurance and cardio training. True HIIT, as in the type and intensities used by Olympic athletes is simply not within the abilities of most average exercisers and is only used in small doses during short periods of time. Circuit training has its place, especially with beginners and bodybuilders, but does not deliver the most efficient results over time. Yes, HIIT and circuit training can be hard. It is taxing. It makes you sore and tired and sweaty. Don’t make the mistake of thinking that means it delivers big results. It will not make you appreciably stronger, it will not give you the ability to go long, and it doesn’t actually burn that many more calories than a moderate weight training or cardio session, and without paying attention to your diet, will not help you lose weight. **Disclaimer**If you prefer high intensity circuit training because you think its fun, by all means, have fun. However, be cognizant of the higher risk of overuse injuries and keep some focused strength work in your routine. And always focus on moving better before adding weight, reps, or speed. Strength training and longer duration cardio are how you build a big fitness base over time. Training only in the middle is how you stagnate. It is especially unwise to take this approach if you are new to fitness as it will hinder your ability to ever break out of that ineffective middle ground. Learn to move correctly, learn how to move correctly under load, add some longer duration activities and you’ll be on your way to better overall fitness. Remember, human potential is great. And it takes a long time to develop. Take your time, learn how your body works, and take the long game approach. Chang SF, L. P. (2016). Systematic Literature Review and Meta-Analysis of the Association of Sarcopenia With Mortality. Worldviews Evid Based Nurs, Epub ahead of print. Michael McLeod, L. B. (2015). Live strong and prosper: the importance of skeletal muscle strength for healthy aging. Biogerontology, Open Access. Watson SL, W. B. (2015). Heavy resistance training is safe and improves bone, function, and stature in postmenopausal women with low to very low bone mass: novel early findings from the LIFTMOR trial. Osteoporos Int., 2889-94.